Register Log In ECN Forum Forums Violation Photo Forum This needs some Support! <p align="left">This box is located on a busy street in front of a commercial strip. It is stubbed up at the grassy area between the parking lot and the concrete sidewalk. We are working to identify the property owner/responsible parties, so that they can be given Notice, to make replacement and repairs of this box. 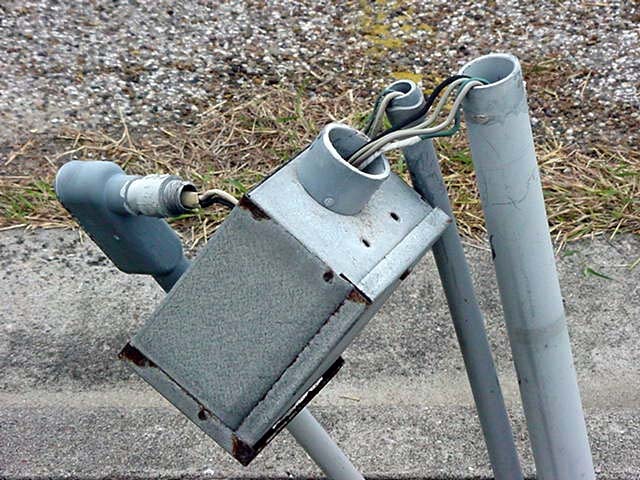 The use of the nonmetallic sheathed cable in the conduit, is not the least of violations which will be listed on the Notice. Although they might be discolored from weathering (a bad situation in itself), it appears that there are 1 black, 2 white, and a green conductor in the homerun. So, why did they culprit feel it was necessary to put white phase tape on that green wire? Something doesn't look right with those colors of wires.